As was evident in our previous post on Autodesk Dragonfly Project, we are now beginning to see online applications that not only rival their desktop counterparts, but in some ways surpass them. The internet is a host to such a diverse number of applications, that Google's announcement about their new Chrome OS centered around a browser makes even more sense now than it ever did. Splashup previously known as Fauxto, is an online image editing software built on Flash and can be run straight from your browser. It offers the basic features that are expected from any image editor today. When most people think of image editors, the first name to pop in mind is usually Adobe's highly popular Photoshop software. Yet for most users the simplicity of Microsoft Paint is all that is needed. So why do so many people shoot a fly with a bazooka? Microsoft paint has barely evolved in the many years since it was created, and for most people a compromise of features between these two extremes is required, and one which is nearer the Paint end of the spectrum. The good news is that online applications have now reached the level where they can perform the essential tasks straight from your browser without requiring much more than the Flash plugin. Splashup is exactly such a software. The Splashup website opens up with an option to "Jump Right In" to the Splashup application, while also offering a light version of their application which they reserve for a "more fun and casual image editing experience". The light version offers a simplified interface and was designed for Mobile devices, however it is also available for desktop users as an AIR application. You can start using Splashup right away, however to use some of its social features you will need to create a free account. The account creation process is simple and fast, and requires you to enter minimal details. Having an account means that you can connect splashup to many of the online photo sharing services it supports. 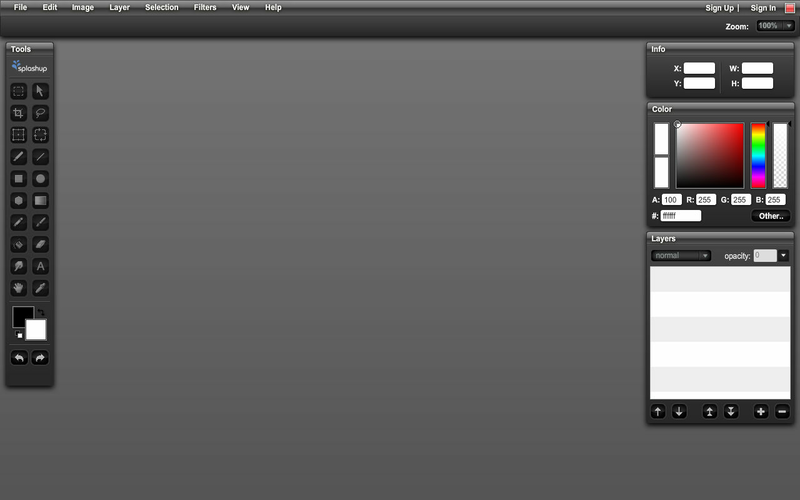 Splashup presents a slick dark-grey interface, very desktop-like, an interface similar to Photoshop, in fact. 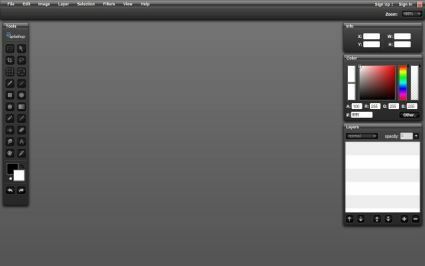 You are presented with a menu bar on top, a tool panel to the left, and three panels to the right, for information, color selection, and layers. The panels can be dragged around the window to any position desired. The interface is quite user-friendly, with features clearly categorized under menus. The tool pallet icons are quite good representations of the function they perform, and quite similar to other photo-editing software, making them easily recognizable. New images or images opened for editing open in windows as in any desktop image editing software. New images open with a blank transparent canvas that's represented by the usual grey-white checkered pattern. Overall the interface is designed well to mimic the functionality of desktop software to make it even easier for people to begin using it. One thing desktop users are bound to miss are some of the common shortcuts, such as those for cutting, copying, pasting, saving, undoing, and so on. However this is more of a limitation of the browser Flash combination, and probably not a feature that was overlooked. Splashup offers a good selection of features for basic day-to-day image editing. The selection of tools is extensive enough for most scenarios, and even comes with some rather more advanced (for such a tool) features such as smudging. 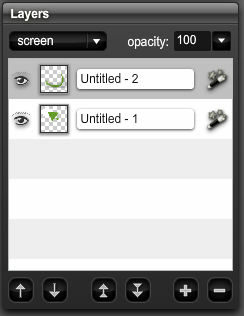 Most tools offer some level of customization, via a panel of options that fills up the panel below the menu bar on top. Selection and drawing options give you the facility to draw rounded edges for the shapes, the pen and eraser tools allow you to pick a shape, size, turn on feathering, and even turn on random rotation of the brush shape. The layer panel allows for manipulation of multiple layers in a document each of which can be named and individually turned ON or OFF and preview of each layer is also available. Layers also support a small set of effects: blur, bevel, shadow, glow, gradient bevel, and gradient glow, and blending effects. Which are pretty much the same as those available in Flash 8 onwards. Each layer effect offers some degree of customization as well. 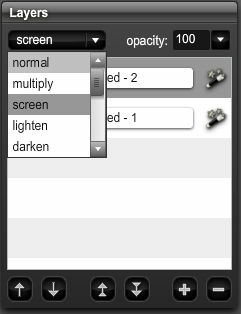 Splashup also comes with a selection of filters which can be applied on a per-layer basis. 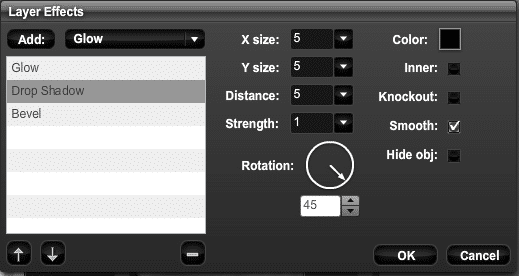 The filter selection is a basic collection of essentials such as sharpen, blur, etc. but also throws a cloud renderer. 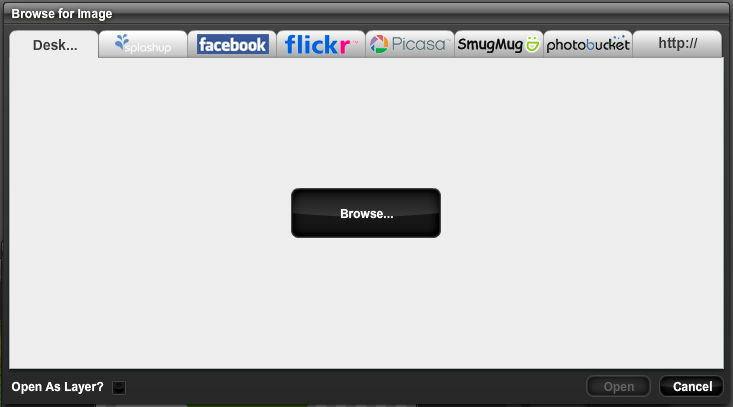 The filters apply quite quickly considering that this is a Flash application running within a browser. 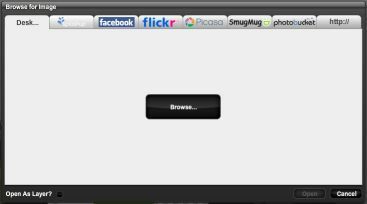 Some of the other useful features it includes are a full-screen mode, and capturing images from a web cam. Splashup can export your images to JPG, PNG, or its own format FXO, although there was some trouble loading FXO files. Overall its selection of features is adequate for daily use scenarios, and its performance is good enough for it to be considered a desktop alternative. Splashup comes with integration with some of the most popular social networks with images. Once you create a Splashup account, you can import images from and save images to Facebook, Flickr, Picasa, SmugMug, Photobucket, and of course, to your own hard disk. You can additionally also load images from a URL. A minimal level of social connectivity is expected of any Web 2.0 application, and Splashup delivers, with its support for the major image sharing services. To access each service you need to first authorize it to access that service. This is for the most part a painless procedure, and is pretty much the same for any application accessing these social networks. 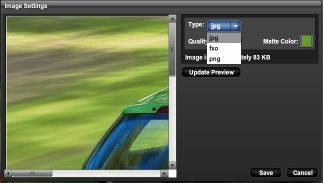 Splashup is by no means a replacement for tools like GIMP and Photoshop, for power users, desktop solutions offer the best features and performance still. However, if you constantly find yourself frustrated by Paint for performing simple operations such as cropping images or changing hue and saturation, or if you mostly need to work on images stored on your online photo storage service, Splashup may be your salvation.